The newspaper source of this incident gave no specific date of occurrence. 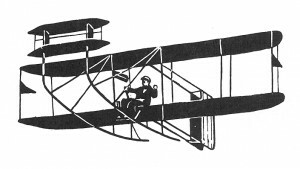 Sometime during the month of September, 1910, Chester Karyman was test-flying an airplane belonging to Professor Clarence C. Bonnette over St. Johnsbury. The aircraft had reportedly reached “a considerable height” when it began to be buffeted by winds. As Karyman was bringing the plane down to land, he shut the engine off too soon, causing the craft to abruptly drop from the air and smash into the ground. The plane was badly damaged, but fortunately Karyman escaped with minor injuries. The aircraft involved in this accident was a Curtis-type airplane named Vermont, or Vermont 1, because it was the first to be constructed in the state of Vermont. It was built by Professor Bonnette the previous winter, and test flights had begun in August, 1910.